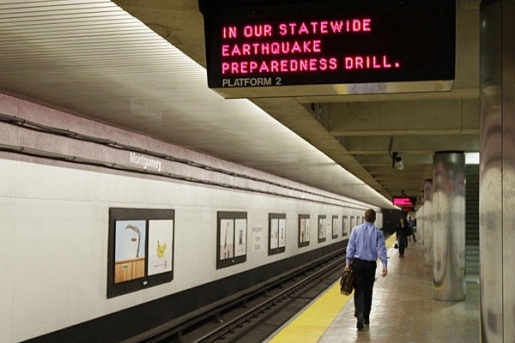 "During an earthquake drill, please run around screaming and flailing your arms." In 1989, the city of San Francisco was rocked by the Loma Prieta earthquake. The 6.9-magnitude earthquake rocked the World Series (which was going on at the time), killed 63 people, and caused $10 billion dollars in damage. Exactly 22 years later, San Francisco has experienced not one, but two earthquakes on the anniversary of Loma Prieta. At 8:16 PM, San Francisco was hit by a 3.9 earthquake; six hours earlier, the city was hit by a 4.0 earthquake. Of course, San Francisco is no stranger to earthquakes. Every weird animal behavior is believed to be an earthquake warning. San Francisco shakes pretty often; after all, it’s not New York. San Franciscans know their quakes, and they remember Loma Prieta. I have no doubt that the shaking earth on the anniversary of one of the most devastating earthquakes in the history of the city had more than a few people worried about what might happen. These don’t seem like aftershocks, or just small self-contained quakes to me. I’m no geologist, but if I was in San Francisco, I’d update my earthquake preparedness kit, because there might be a big one coming soon. That may not be true, but it’s definitely how I’d be feeling if I was in the city by the bay.